AIDA is the benchmark – and HEROSE is on-board: in February 2017 construction of the world‘s first cruise liner that runs exclusively on LNG began at the Meyer shipyard in Papenburg. The ship with approx. 2600 cabins should be put to sea in Autumn 2018, another type of the same construction will be launched 2021 in Papenburg. Around 350 HEROSE valves from DN15 to DN200, weighing seven tonnes in total, are being used in the construction of the first ship, the AIDAnova. The valves have a Fire-Safe certificate and can be operated manually or pneumatically. Valves that are used to regulate the required gas flow via positioners are also included. The order was quite a challenge for HEROSE. As work progressed, it turned out that various modifications were required. All work was supervised and the necessary cryogenic tests were approved by RINA, the Italian ship classification society. HEROSE was commissioned by Marine Service GmbH in Hamburg, a company specialising in maritime LNG fuel gas systems with a formidable reputation worldwide. Marine Service GmbH is also responsible for the design of LNG systems in new AIDA construction projects – from checking the drawings to supervising the construction and delivery of the hardware as well as complete automation and ultimately the commissioning and delivery of the overall system to the Meyer shipyard and shipping company. 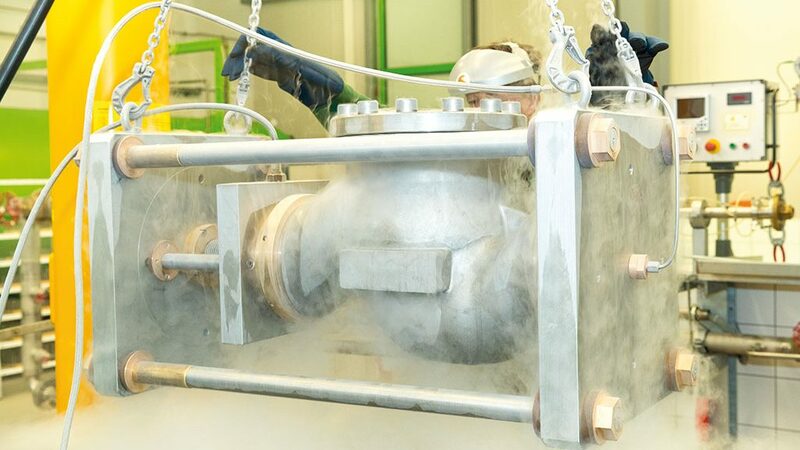 To test the LNG engines, Marine Service GmbH developed an in-house test bench where the valves supplied can also be checked within the framework of the overall LNG concept.